Your SupplyWorks account executive is a facility maintenance expert and available to help identify ways to drive efficiencies in these specific areas: controlling operating costs, improve building health, safety and security, enhancing your facility's image, increasing staff productivity and helping your organization meet sustainability goals. Only SupplyWorks provides you the convenience of delivery right to your door on thousands of cleaning, maintenance and repair items, will call pick up at many of our locations across the country and the extra convenience of immediate pick up at nearly 2,000 Home Depot stores across the U.S, all with the convenience of single monthly invoice billing. Choose SupplyWorks for the industry's broadest selection of cleaning, maintenance and repair products to meet the diverse needs of schools, office buildings, healthcare facilities, retail, hospitality, building service contractors and many more. Select from our unsurpassed assortment of name brand and exclusive brand products. 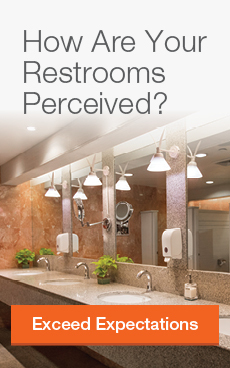 Our programs are designed to provide smart solutions to your everyday facility needs. Choose The Home Depot ProPurchase Program and gain the benefits of single invoice billing for all your planned and unplanned purchases when you shop at SupplyWorks and the Home Depot. The Home Depot Renovation Services Program is your turnkey solution to carpet & flooring, counter top, HVAC and appliance installation. The StockWise program is a customizable solution to help you manage your inventory more efficiently. SupplyWorks In-Site has a proven track record of keeping facilities cleaner, healthier and more sustainable while reducing operating costs by as much as 30%. Advanced eCommerce capabilities offer speed enhancing features, product information, tracking and analytic capabilities offered through our eCommerce ordering platform. 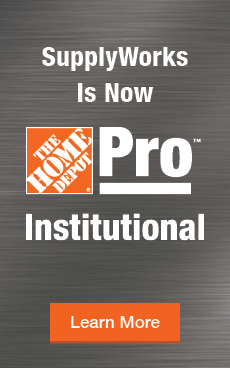 SupplyWorks, A Home Depot Company, is the leading national provider of integrated facility maintenance solutions. Offering more than 94,000 janitorial, maintenance and hardware products, and backed by the power of The Home Depot, we serve a wide array of customers, including offices, schools and universities, and health care institutions. Purchase products and services, which include tool and truck rentals, using your SupplyWorks credit account for payment. At checkout, simply swipe your card to complete your transaction. If you use self-checkout, select the credit button to complete your transaction. You will have visibility to all of your purchase transactions and with SupplyWorks. Electronic receipts for store purchases will be emailed to a designated address and will also be detailed on your SupplyWorks invoice or statement. Multiple cards can be set up for your account. When you need it now, you have the flexibility to shop at our store locations at nights or on the weekends. Supplement your SupplyWorks supply orders with access to thousands of items. Products like lumber, drywall, insulation, windows, cement, and masonry allow you to finish the job. SupplyWorks keeps you informed on the latest health advisories as well as providing timely information on keeping your facility healthy and clean. Read our tips below to keep your facility clean and germ-free. At SupplyWorks we know you need to keep your building occupants safe by implementing the latest products and procedures for proper materials management, slip and fall prevention and minimizing accidents at your facility. Follow the tips below to keep your facility’s occupants safe and protected. Facility managers today are under increasing pressure to do more with less. SupplyWorks has industry and product experts in your market who can help you. In addition to competitive prices, we offer a consultative, total cost management approach that is tailored to your specific needs. Keep your facility moving forward with inventory management from SupplyWorks. Our free and fully customizable organization tools and full-service StockWise™ inventory management solutions are built to help you manage inventory, improve productivity and reduce costs. Take control of your bottom line today. How do I place an order with SupplyWorks? How can my agency participate in the OMNIA Partners program? All States, State Agencies, Counties, Cities, Schools, Colleges and Universities, Non-Profits and Special Districts. Is there a fee associated with joining OMNIA Partners? No, there are no costs or user fees to participate or register. If my agency already has an account with you, do I need to set up a new account? No. Contact your SupplyWorks Account Representative at uscommunities@supplyworks.com to have the OMNIA Partners program linked to your existing account. Yes. The contract has been competitively bid by a government agency. Through the Joint Powers Authority or an inter-local agreement, local governments can "piggy-back" this competitively bid contract through OMNIA Partners. This satisfies the competitive bid requirements in most states. See state by state laws on intergovernmental purchasing. Complete the free online registration found on the OMNIA Partners website. During the registration process, you will be asked to select the suppliers you are interested in. The suppliers that you select will contact you with detailed pricing and ordering information. No, there are no costs or user fees to the local agency to participate or register. Does the competitive pricing apply, regardless of quantity? Using Supplyworks and the OMNIA Partners program assures an agency they are getting a very competitive price on any size order. There are no costs, minimum quantity requirements or spend limits associated with using the SupplyWorks OMNIA Partners program. Does the competitive pricing apply, regardless of quantity ordered? SuppyWorks and the OMNIA Partners partnership assures an agency they are getting a very competitive price on any quantity ordered. There are no costs, minimum quantity requirements or spend limits associated with using the SupplyWorks and OMNIA Partners program. Implementing sustainable practices for your facility is a win for the environment as well as a total cost saver. Your SupplyWorks team is here to help, whether you wish to conduct an audit of your cleaning materials, water usage, energy usage or improve the air and sound quality of your facility so you can achieve LEED certification. When disasters strike, you can count on SupplyWorks to make sure you are prepared for any emergency and have the supplies you need to recover. From extension cords to tarps, we have the products you need to weather any storm. Click here to learn more about SupplyWorks emergency preparedness products and solutions.